In 1949, lawyer, historian, and journalist Carey McWilliams stepped back to assess the state of California at the end of its first one hundred years—its history, population, politics, agriculture, and social concerns. As he examined the reasons for the prodigious growth and productivity that have characterized California since the Gold Rush, he praised the vitality of the new citizens who had come from all over the world to populate the state in a very short time. But he also made clear how brutally the new Californians dealt with "the Indian problem," the water problem, and the need for migrant labor to facilitate California's massive and highly profitable agricultural industry. 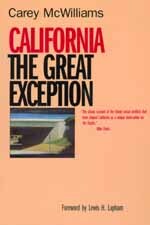 As we look back now on 150 years of statehood, it is particularly useful to place the events of the past fifty years in the context of McWilliams's assessment in California: The Great Exception. Lewis Lapham has written a new foreword for this edition. Carey McWilliams (1905-1980), editor of The Nation from 1955 to 1975, also served as California Commissioner of Immigration and Housing for four years. He was the author of many books, including Factories in the Field, Ill Fares the Land, Brothers under the Skin, A Mask for Privilege, and Southern California: An Island on the Land. Lewis H. Lapham, a native San Franciscan, is the editor of Harper's Magazine.